Studio042 in Montclair, New Jersey was established in 1989 as a franchised Quick Printer. After 21 years we bought our way out of the franchise system so we could expand our business in ways that fit us and our Clients. Our Clients run the full spectrum from small businesses and non-profits all the way up to the Federal Government. 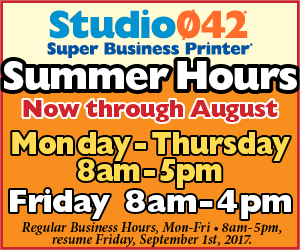 Studio042 in Montclair, New Jersey is a full-service printing, engineering reprographics and visual communications company. We offer complete in house design, enterprise level duplicating and digital printing, in both color and black and white. Full bindery, in house CD & DVD duplicating, mailing services, signs, posters, banners and branded apparel for any event. Dedicated to serving the needs of our clients. We do more than just design, create, print and circulate your ideas––we help you communicate. Let our team of professionals work with you to find the best solutions for your needs. We offer complete direct marketing solutions that include the latest technologies in variable data printing, 1:1 marketing and cross-media campaigns. We are committed to quality and customer satisfaction, every job is very important to both of us. Whatever your printing or visual communication needs is we can help. Call us or e-mail us today to get started.